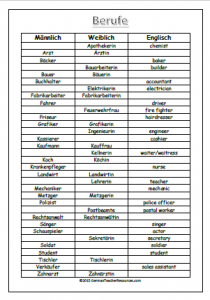 Currently viewing the tag: "Vocabulary Lists"
German jobs vocab exercise where students should fill in the missing masculine version, feminine version or the English equivalent. This is a gap fill version of a vocabulary worksheet you can download from here. Click on the image below to download the gap fill version.